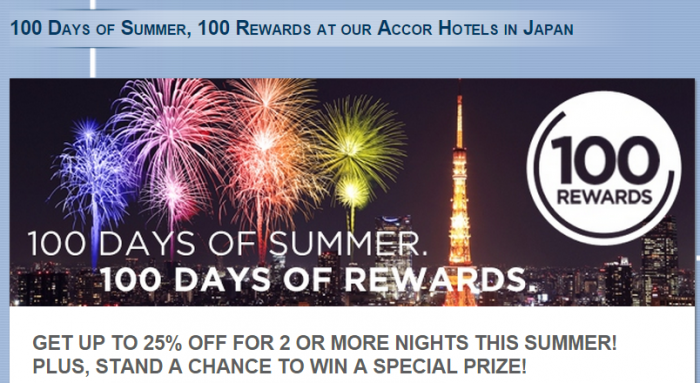 Le Club Accorhotels has launched 100 Days of Summer 25% off promotion for stays in Japan between July 8 – September 30, 2015. The offer is valid for booking starting on July 1 and comes with 100 rewards that Le Club Accorhotels members can win during their stays over this promotion. You may get lucky and win of the prizes, although the chances are obviously very low. It is, however, a sale to keep in mind if you are going to Japan this summer and early fall. *Subject to ending when all gifts have been distributed. -To benefit from this campaign, your booking must be made on Accorhotels.com or our participating brands web sites, via the accorhotels.com application or via Accor call centers as a Le Club Accorhotels member. All other reservation channels will not be eligible for this campaign. -You can also be enrolled at our participating hotels upon check-in to be eligible to this campaign. -To enter, Entrants must, during the campaign period, sign in as a Le Club Accorhotels member or join for free, and book one of the rates available on Accor Hotels official websites including accorhotels.com, or our participating brands web sites, via the accorhotels.com application or via Accor call centers. -Upon check-in, a lucky draw box will be presented at reception desk for your drawing. -One member can enter a lucky draw only once during each stay. -The gifts are limited to the stock on hand and the distribution of the gifts will be up to discretion of the hotel. -The gifts will be distributed to guests upon check-in or during their stay. -Winners will be randomly selected from a drawing. -The gifts are not transferable or exchangeable and cannot be taken as cash. -If entrants win Le Club Accorhotels bonus points, points will be credited around 10 days after check-out. – Offer valid for bookings made between July 1st, 2015 and September 23rd, 2015, prepaid online on www.accorhotels.com, for stay(s) between July 8th, 2015 and September 30th, 2015 (both dates inclusive and based on local time of the hotel in which room(s) are being booked). -“We LOVE Summer Public Rate” offers 15% discount for 2 or more stays, and “We LOVE Summer! Member Special” offers 25% discount for 2 or more stays for Le Club Accorhotels and Acocr Plus members. – Booking cannot be changed, cancelled or exchanged, and it cannot be combined with other discounts or special offers. The rates are not eligible rates for the purposes of earning benefits in any third party loyalty program. Bookings must be made 7 days prior to your arrival date. – Prices are displayed per night, single or double rooms, in Japanese currency depending on a chosen destination and are exclusive of city tax for hotels in Tokyo. Foreign exchange rates are for information only and are not binding. Currency applicable to the transaction and charged to your credit card are confirmed upon booking. – Payment must be made online by credit card upon booking. -To benefit from this offer, your booking must be made on Accorhotels.com or our participating brands web sites, via the accorhotels.com application or via Accor call centers. All other reservation channels will not be eligible to this offer. – Offer valid in participating Accor hotels and subject to availability for this promotion, excluding any black-out dates set by a participating hotel. There are a limited number of allocated rooms (determined by each participating hotel) and on some days there will be no allocation. -You must provide your loyalty card number or member number when making your reservation and present your card at the reception desk of your hotel when you check-in for your stay. 25% discount if you stay 2 or more nights. A minimum of two nights are required. *Accor Plus members cannot use or combine with their complimentary night voucher to book this offer. If it is used/combined, the benefits of the “We LOVE Summer” offer will be void. General Le Club Accorhotels terms and conditions apply, to the “We LOVE Summer” offer. 1. This offer is valid for every eligible stay with an arrival date between July 8th and September 30th, 2015 for eligible stays booked before September 23rd, 2015. 3. You must book your stay 7 days prior to your arrival on accorhotels.com to benefit from this offer. 5. Reservations that include several rooms covered by the same member during his or her stay are only counted as one stay. 6. This offer may not be combined with other current offers or advantages and does not apply to groups. 8. Your points will be credited on your account from 10 days after your Check-out date. 9. In cases of conflicting terms and conditions, the terms and conditions in English have priority. Previous articlePrepaid Data SIM For China With Access To Google, Gmail, Facebook, Twitter Etc. Next articleBaha Mar Files For Bankruptcy Protection – What Happens & When Will Hyatt, Rosewood And Mondrian Hotels Open?